You can do Linux rescue work using Recovery Is Possible (RIP) is a Slackware-based Bootable CD . It will support lot of filesystems (Reiserfs, ext2, ext3, UDF, iso9660, XFS, HPFS, NTFS, DOS and VFAT). It will also support Harddisk Types IDE, SATA, SCSI, PCMCIA, RAID, LVM2, and Network like Ethernet,DSL,cable,PPP,PPPOE. This Cd is equiped with a very good collection of recovery utilities. * cdrwtool, mkudffs and pktsetup for optical media. * jfs_fsck to check and repair a Linux file system JFS. * e2fsck to check and repair a Linux file system ext2 or ext3. * ntfsresize for resizing the Windows NTFS without losing data. * ntfs-3g to write to Windows NTFS. 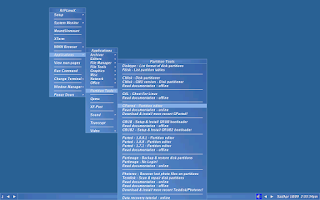 * chntpw can view information and user passwords on Windows systems. * cmospwd allows you to retrieve password from CMOS / BIOS.